SARASOTA, FLORIDA, January 2, 2018 – The initial construction phases of the bayfront Quay mixed development in north downtown Sarasota is set to begin this 2018, following final city approval of this project in early December. The approved general development agreement sets an overall layout for the site and allows for up to 695 condo units and 175 hotel rooms, as well as retail space of 189,050 square feet and office space of close to 39,000 square feet. A maximum of nine buildings up to 18 stories tall have been approved for this property of nearly 15 acres flanked by a wide selection of Sarasota homes for sale. Seven years of construction is projected in order to complete the Quay development. 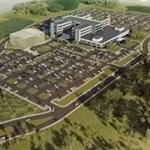 A project of Tampa-based GreenPointe Holdings, this project has been estimated to cost approximately $1 billion which should bring significant ripple effects on the local construction sector and the Sarasota real estate market. The Quay will be developed in nine stages or “blocks,” each subject to reviews and public hearings as they are individually designed. Likely to be first developed are the blocks at the southern edge and southwestern corner of the property which would open new choices of Sarasota condos for sale. The Kolter Group earlier announced that it is bringing its condo project Ritz Carlton Residences (erstwhile known as The Grande) to the latter site. Originally planned at the Ritz-Carlton property adjacent south of the Quay, the Kolter’s new condominium is set for 73 units within an 18-story building. Kolter said the Quay provides its planned condo with a larger and direct waterfront site that gives a more exclusive identity and scenic location for its future residents. This new site also allows immediate access to the amenities available at the Ritz-Carlton campus as well as those set at the Quay, Kolter added. The development of a “waterfront district” on the southernmost area of the Quay comes next in the clipboard for the GreenPointe mega-project. This district’s blueprint calls for the establishment of a public plaza, shops and restaurants. Design, permitting and construction of the support infrastructures for the entire Quay project, such as road-building, water supply and sewer installations, is expected to proceed in 2018. There are two caveats, however, before any new vertical construction can begin in this development. One the prerequisites is the restoration of the historic Belle Haven at the center of the Quay perimeter on 1133 El Vernona Avenue. 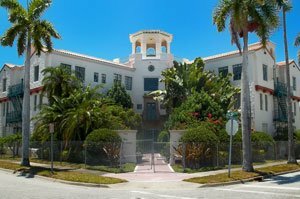 This vintage building was built in 1926, and its Mediterranean Revival style was one of the designs of the revered local architect Dwight James Baum. Originally known as the El Vernona Apartments, it provided luxury bay front accommodations for seasonal Sarasota residents. 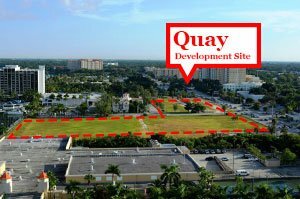 Another precondition prior to erecting new Quay buildings is the construction of several multi-use recreational trails along the Quay waterfront and U.S. 41. GreenPointe likewise has to first construct the long-planned roundabout at Fruitville Road and U.S. 41 two-lane. This roundabout will serve as the main gateway to the Quay bayfront project. Significantly, two smaller real estate developments are already well underway near the Quay. This pair—the construction of Embassy Suites and Hampton Inn & Suites—are projects of Jebco Ventures. They are located on the first two blocks just east of the planned Fruitville roundabout leading westward to the Rosemary District which is likewise abuzz with new construction and fresh offerings of Sarasota condos for sale.